We have good news and bad news. The good news: we've surpassed 500,000 page views on our LEGO CUUSOO project page. The bad news: we still haven't reached the halfway mark of 5,000 supporters. But you played hardball. And you know what? One special prize isn't enough. That's why, once we reach 5,000 supporters, we'll be giving out TWO special prizes. That's right, we'll give away the Dr. Hare Deluxe Ballon AND the Insignia Deluxe Balloon just as soon as the 5,000th person signs on to support Dr. Hare's Lair at LEGO CUUSOO! Can you be the one to help us reach this goal? Don't do it for me, or for the thousands of other Poptropicans who would love a couple of free balloons. Do it for yourself. You deserve something nice. Heroes. Villains. Action. Suspense. Laughter. Tears. The best movies truly have it all. But nothing's better than a good old-fashioned chase sequence! Keep an eye out for more movie magic when Back Lot Island comes soon to Poptropica! This summer, two more illustrated novels based on your favorite Poptropica Islands will be making their way into stores! Here's a quick look. Lunar Colony: What starts as a boring family vacation becomes an out-of-this-world adventure when 13-year-old Glen Johns is accidentally blasted to the moon. On the lunar surface, he'll search for a missing astronaut, find the source of a mysterious transmission, and uncover a secret as old as the stars. Cryptids Island: When Annie Perkins learns of a million-dollar prize for finding proof of the existence of legendary monsters like Bigfoot and the Loch Ness Monster, it seems like the perfect way to save her family's restaurant. But as the competition heats up, Annie will have to deal with a different kind of monster -- a ruthless fortune hunter named Gretchen Grimlock! Both of these books will be available on August 1. If you can't wait that long, check out our other illustrated novels, Astro-Knights Island and Skullduggery Island. They're both out now! How many different looks do you see in this picture? Even with endless possibilities, we all tend to gravitate to our favorite looks. Which ones would you keep in your closet? 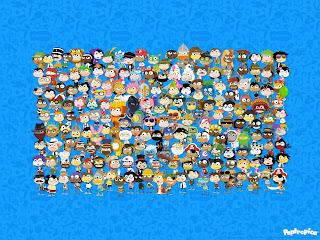 For inspiration, you can download this free Poptropica Crowd wallpaper, or print out a poster version. Members, you can save 30 outfits to your closet. Is your closet stuffed to the gills, or is it bare and waiting for you to go shopping? Not a Member? Become a Member today! Minions, I am disappointed. Yes, thousands of you have supported our "Dr. Hare's Lair" project on LEGO CUUSOO, and as such, will be last in line to be brainwashed. But we are still thousands of votes from our goal! Therefore, in order to move the process along, it has become necessary for me to offer an enticement -- a "carrot," if you will. That's why, once our project reaches 5,000 supporters, we will be offering everyone a brand-new Bunny Balloon! Ah, but lest you think we'll just hand this out willy-nilly, think again. This new, free item will ONLY be available when and if we make it to 5,000 supporters! So, time for you laggards to act. Visit our LEGO CUUSOO project page to find out how you can support Poptropica! "What's the next Island going to be?" That's the question we hear over and over when we talk to our fans. Well, if you want a hint as to what we're working on next, the best thing to do is visit Sneak Peeks in the Daily Pop! In Sneak Peeks, we post concept art and other work in development for unannounced Islands. If you'd been checking Sneak Peeks through January and February and seen images like the one posted above, you probably would have surmised that we were working on a movie-themed Island... long before we announced Back Lot Island! Sneak Peeks is updated five days a week. All you need to do to check it out is to visit Poptropica and click on the "Daily Pop" icon to see the latest. We're usually working on more than one Island at a time. Can you guess what we might be working on next? The latest and greatest Members-only Back Lot Island power is now available in the Poptropica Store. With "The Silent Treatment," you can turn your Poptropica playthrough into a black-and-white movie, complete with film grain! It's a look like none other in Poptropica's history. Prepare to celebrate the movies even more with Back Lot Island, coming soon to Poptropica! Another new item has just arrived in the Poptropica Store to herald the coming of Back Lot Island. Now, Poptropica Members can get the Clapboard item. Equip the Clapboard, and press the spacebar to call the next take. Cut. Print it! You're a natural. Poptropica Members, a new costume has premiered in the Poptropica Store just for you! Now, you can get your hands on the Director costume, which comes with a beret, pinstriped outfit, and a bullhorn that lets you call the shots. Just visit Poptropica and log in with an active Membership to claim your Director costume. And keep an eye out for Back Lot Island, coming soon to Poptropica. Since the Night Watch Island public launch last Thursday, thousands of you have received gold medallions! Congratulations to these 10 Poptropicans who finished the quickest once Night Watch Island was open to everyone. 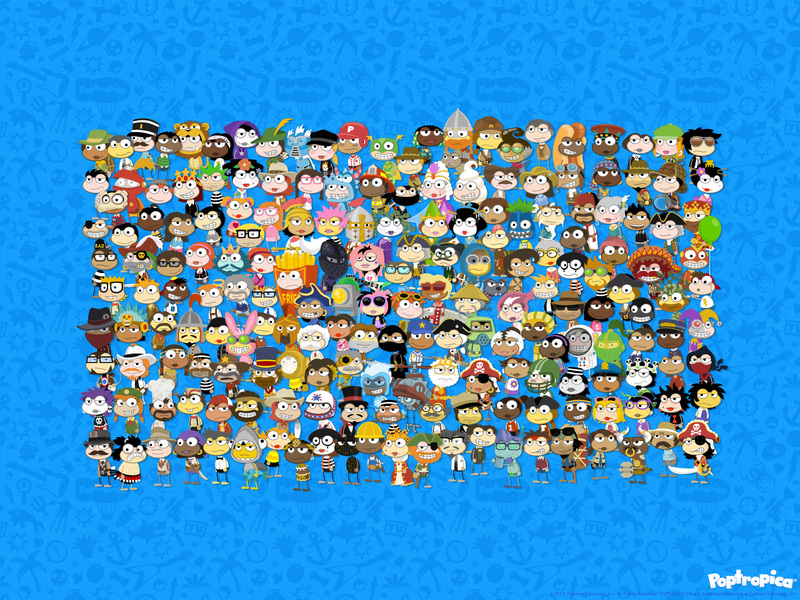 Want to be one of the first Poptropicans to play Back Lot Island? Don't wait! Become a Member now for Early Access! For more information, visit our Back Lot Island info page. And keep checking right here for the latest news about Back Lot Island! Night Watch Island is now available to all! Get ready to investigate the strange goings-on that are happening after hours at the mall. Can you keep the stores safe from a crafty cat burglar? 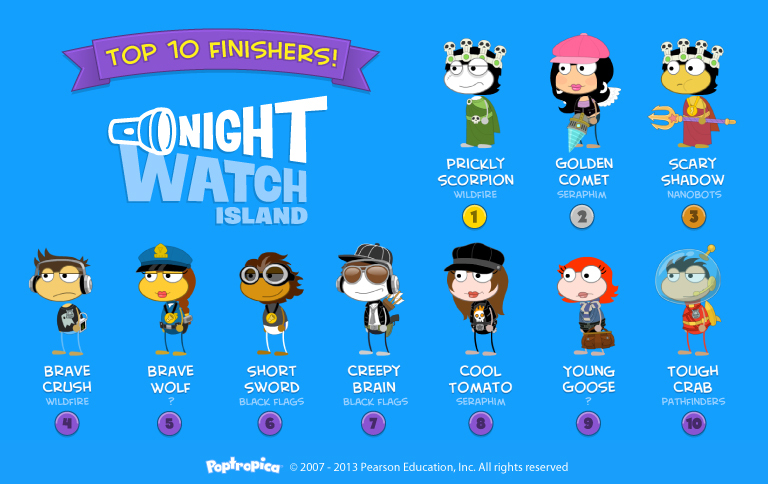 Visit Poptropica now to play Night Watch Island! When you travel somewhere, the best way to remember your trip is by taking photos. The same is true when you journey into Poptropica. Ever since we launched the Photo Album feature last year as part of Poptropica Friends, we've been adding four new photos to every Island. At this point, there are 133 unique photos that you can collect, simply by playing through each Island! But Poptropica photos are even better than the ones you take on vacation, because you can actually costumize off of what you were wearing in each one. The same is true when you look through your friends' photo albums! If you haven't opened your photo album for awhile, take look -- you might be surprised at what you find. Night Watch Island becomes available to everybody one week from today. But that also means that you've only got one week left to claim your Members-only Cat Burglar costume! Once Night Watch Island opens to the public, this one-of-a-kind costume is gone for good. How can you get your paws on this outfit? Become a Poptropica Member today, and then visit the Poptropica Store to get it. You'll get to keep the costume forever, even after your Membership expires! If you've ever wanted to be featured on the cover of a magazine, we have a treat in store for you on Night Watch Island: your face on one of several magazines! The picture above is just one example. Whatever your fancy, you can put your avatar on the magazine cover of your choosing. Night Watch Island is available now for Poptropica Members! Your heart will soar like the eagle if you just look at this helpful motivational poster every day. I don't know about you, but when the week begins, I have a tough time getting going. Fortunately, my neighborhood coffee shop is always there to help perk me up. What's the best part about going to the mall? Seeing all the great stuff for sale. What's the worst part about going to the mall? Not being able to buy it all! We think that's just as lame as you do. That's why, on Night Watch Island, there's a lot of free stuff available for you. You can costumize most anything you see in a clothing store. There are kiosks that you can use without limit to give yourself new hats, souvenirs, and even smells. You can even get a tan! Play Night Watch Island today with Membership, and you might find that your local mall just isn't as exciting anymore!